Since there’s a real Xperia Tablet S out there, shown at IFA 2012 Berlin and it keeps the same disappointing design of the Tablet S, let’s see what Frank Tobias imagined for a future Sony slate. 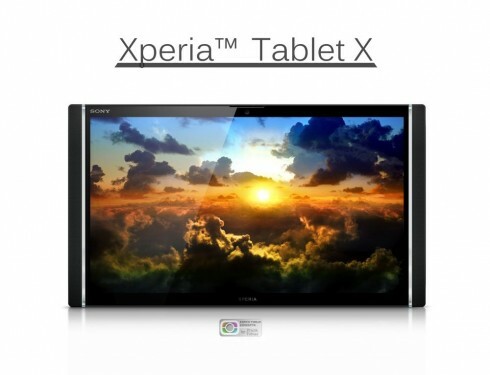 He created the Xperia Tablet X mockup, that you can see below. It seems to adopt the Xperia S design, with those transparent rings, but it has two on the sides, instead of one. Seeing the orientation of the logo, this is more of a landscape style device and I suppose that the grilles next to the transparent areas hide some speakers. The thing is that when you hold the tablet in landscape you will cover the speakers with your hands, although not entirely. I can also see there’s a front camera in there and something that may be an earpiece? Frank Tobias said he’ll be back with more pictures and some specs for this tablet. If you ask me, it’s a quad core affair, with 7 inch display, Full HD resolution, 8 megapixel camera at the back and HDMI out port, as well as DLNA. Also it has some sort of special PlayStation 3 compatibility, that allows it to play some parts of PS3 games on the tablet or even store PSN downloaded games and saves.